In the late 1970s, a group of East Texas visionaries banded together to create a true local bank. "We started Shelby Savings (formally known as Shelby County Savings Association) back around 1978 because we thought our area needed a bank that would be a community partner," according to James Campbell. Campbell, one of Shelby Savings' original organizers, served as chairman of the board from the organization of the bank until March 2012. Campbell, along with F.E. Parker, Fred Wulf, Sammy Dance, Bill Boyd, Gilbert Wheeler, Bobby Lee, Dock Watson, Mitchell Jetton and W.I. Davis chartered Shelby County Savings Association in 1979. Shelby Savings officially opened on July 27, 1982, in a portable building on Austin Street in Center, with three employees and $1.5 million in assets. Joe Fomby was the first president, serving from 1982-1985. He was followed by Gail Cuculic, who served as president from 1985 to 1992, when he became vice chairman of the board. John Snider became president in 1992 and served until he became vice chairman in 2012. Will Lucas became president in 2012 and continues to serve as president today. After many years of service, James Campbell moved to chairman emeritus and Gail Cuculic moved to vice chairman emeritus in 2012. Both retired from the board in 2014. 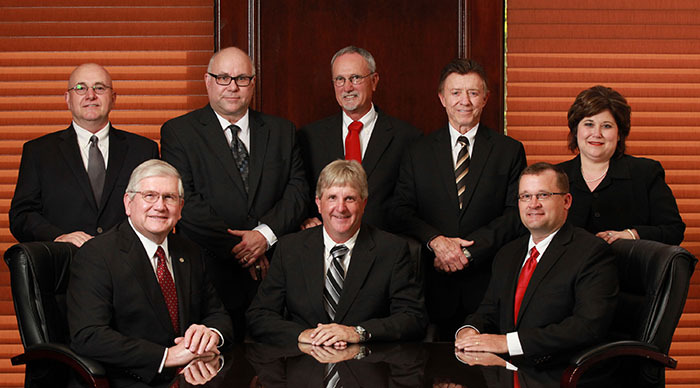 Rick Campbell became chairman of the board in 2012 and still serves in that position. Shelby Savings moved to its current location, a remodeled Goodyear Tire store on Selma Street, in December 1982. In an advertisement inviting the public to the Feb. 11, 1983, ribbon cutting for the new location, Campbell said: "When we first formed Shelby Savings, we did so with one primary goal: to build a new kind of financial institution for the people of Shelby County. A financial institution that would always remember that our roots are here in Shelby County. A financial institution that would be locally owned and operated by our neighbors and friends. Well, we opened the 27th of July, 1982, and your response to our new savings institution has exceeded even our hopes." After six months in operation, Shelby Savings had more than $9.5 million in assets. By the end of the first year, the assets would total more than $15 million. The Selma location was expanded and remodeled in 1986, doubling in size to 12,000 square feet and adding a new drive-through, walk-up service area and additional parking. The Selma Street location was expanded again in 1999, adding 5,500 square feet and a new drive-through facility. In early 2013, Shelby Savings completed yet another remodel of the main building and added 8,000 square feet. The San Augustine and Hemphill branches were purchased in May of 1995 to expand the “Shelby“ style of banking to our customers in the surrounding counties. The Center North location was opened November of 2008 for added convenience. A loan production office was opened in Palestine during 2014. "Today people have much better access to funds because of us, and they know we care about East Texas," James Campbell said back in 1995. Rick Campbell says the same is true today. "Our employees have a feeling for customers and do whatever they can to take care of them. People will respond to and appreciate good service and a caring institution." The mission of Shelby Savings Bank is to be a dynamic, growing and high performance bank that is the premier financial institution within the markets we serve. We are focused on listening and responding to our customers' and communities' true needs while providing the highest level of service.